Roast an entire garlic bulb in the oven. This process will turn what is normally an intensely sharp garlic flavor into a mellow, sweet and caramelized garlic experience. Preheat your oven temp to 400 degrees. Peel and discard the papery thin outer layers of the whole garlic bulb until the cloves and their respective skins are exposed. Using a sharp knife, cut ¼ inch to ½ inch from the top of the cloves, exposing the individual cloves. Drizzle a little bit of olive oil over the cut part of the garlic. Wrap the bulb in aluminum foil. Place the wrapped bulb in a baking dish with the cut side facing upwards. Bake it for 35 minutes. Remove it from the oven and unwrap it carefully. Allow the bulb to cool before handling it. Once it has cooled, take a small paring knife and scrape the garlic cloves out of their shells and place into a large bowl that you will mix your burger meat in. Heat a heavy sauté pan over medium heat. Add 1 tablespoon of olive oil. Working in batches, lay the prosciutto in the pan and cook until crisp. Remove to a paper towel lined plate. Set aside. In the same sauté pan, over medium heat add another tablespoon and sauté the shallots until they are soft and translucent. Mix the ground bison and other ingredients by hand until it is blended well. Form the burgers to desired thickness. 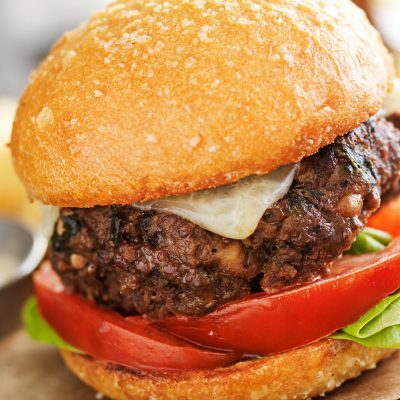 (A thicker burger will be easier to cook to a perfect medium-rare finish.) Place one slice of Prosciutto and Provolone cheese on top of each burger about 2 minutes before you plan to remove it from the grill or pan.